The Oklahoma City Thunder are a very good offensive team — so good, actually, that they average 107.5 points per 100 possessions, the best offensive efficiency in the league. 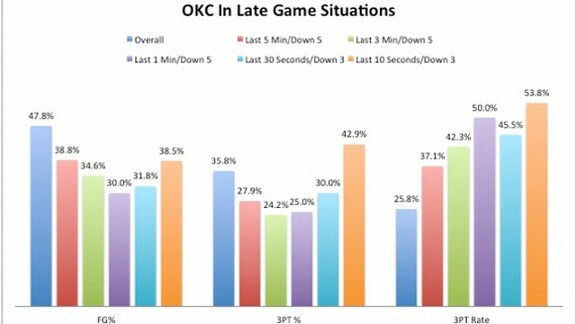 Despite their overall success, the Thunder struggle in one specific area: scoring late in close games. As the game gets tight and the clock winds down, Oklahoma City becomes less efficient on the offensive end. Their inability to score late in games is what doomed Oklahoma City last postseason, and with the playoffs approaching, Thunder fans should be worried about their team getting consistent offense late in tough, grind-it-out games against quality opponents. On this particular possession, there are eight seconds left on the shot clock, and Oklahoma City is inbounding the basketball from the baseline. They initially look to pass the ball in below the free throw line, but when no one is open, the ball goes to the safety valve, Russell Westbrook. As Westbrook catches the ball, he has two teammates, Kendrick Perkins and Kevin Durant, coming toward him to set ball screens. Instead of using either screen and attacking the rim, something Westbrook can easily do with the time left, he settles for a 3-point shot off the dribble with six seconds left on the shot clock. In this clip, the Thunder want to post Kevin Durant up against Gerald Wallace. 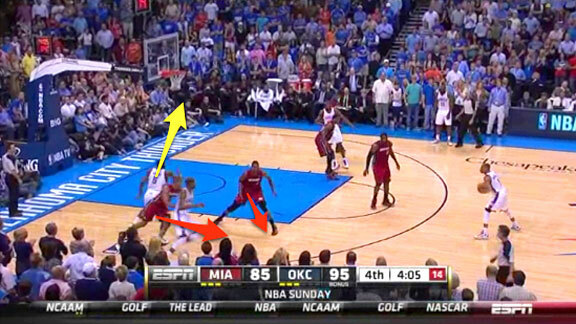 Durant starts fighting for position on the block, but Wallace is able to push him back outside the 3-point line. As a result, everything breaks down. Perkins tries to salvage the possession by setting a screen for James Harden, who pulls up for a 3 with 16 seconds left on the shot clock. Three-point shots late in games are fine, especially if they are coming off sets designed to get an open look for a good 3-point shooter. 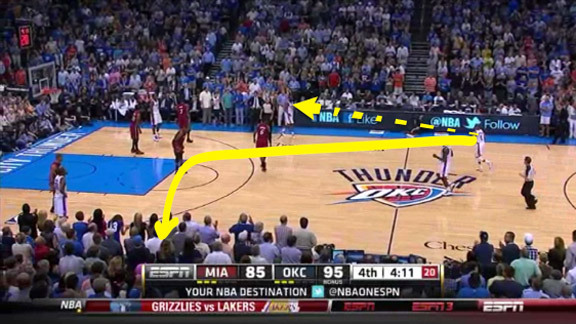 In the two examples above, and most of the time for the Thunder, the late-game 3-point attempts are not designed. In the first clip, Westbrook makes the catch about 45 feet away, walks up to the 3-point line, and lets it fly. In the second, Harden forces up a tough 3-point attempt early in the clock simply because there isn’t anything else going on. This play starts with Westbrook bringing the basketball up the court and quickly pitching it ahead to Harden. 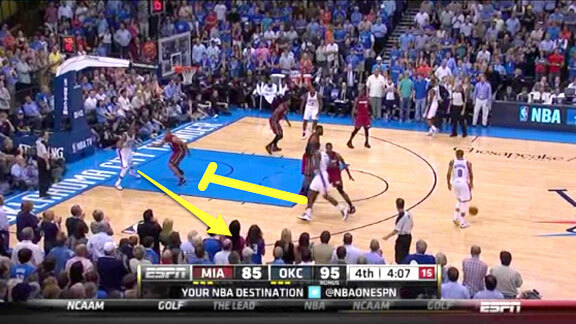 After making the pass, Westbrook cuts to the opposite side of the court. Once Westbrook clears out, Harden gets the ball to Perkins, who was trailing the play. 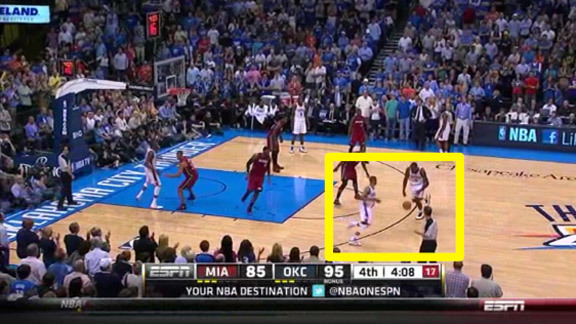 As Perkins makes the catch, Westbrook runs by him and gets a dribble handoff. Perkins then heads straight toward the block to set a pin-down screen for Kevin Durant. Durant does a good job of setting up his man for the screen, something he has really improved upon this season, and then comes off it. Perkins’s man, Chris Bosh, then extends himself out in order to stop Durant from curling off the screen and getting an open shot. This allows Perkins to slip the screen and dive to the front of the rim. Once a team is beaten by a slip like that, they are going to be hesitant in guarding the original option so hard. The result is that the original option opens up, which is what happened against Miami. Here, we have the same play. 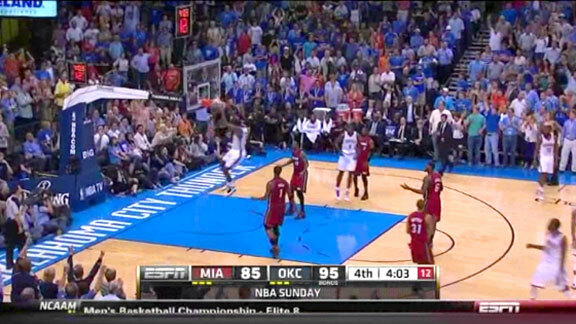 Although it isn’t run as crisply, it frees up Durant to make the catch off the pin-down screen. After some more very good ball movement, the ball goes to Durant for the wide-open 3. This is a 3-point shot late in the game that does come off a set. More importantly, it comes off ball movement. In most screens that the Thunder set, Kendrick Perkins is the screener. This allows teams to hedge off him and force the ball out of Harden’s and Westbrook’s hands. With Durant as the screener, teams are forced to pick their poison. Hedging out on Westbrook or Harden means Durant is going to be open popping out or rolling to the rim. 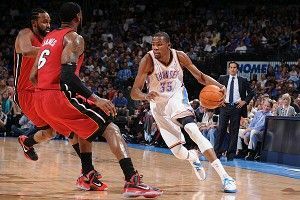 Sticking with Durant means Westbrook or Harden can get to the rim with a head of steam. The defense is put in a tough situation either way, and it’s these types of simple sets that can give the Thunder the late-game advantage they’ve been lacking.